With less than six weeks before it plays host to the Olympic sailing regatta, the city of Qingdao has mobilized thousands of people and an armada of small boats to clean up an algae bloom that is choking large stretches of the coastline and threatening to impede the Olympic competition ... Officials in Qingdao said pollution and poor water quality did not have a "substantial link" to the current outbreak, according to Xinhua. Yeah, right... sure it didn't. 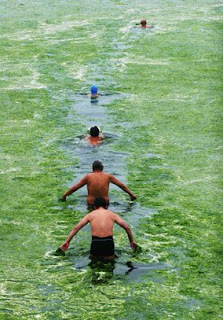 You gotta love the Chinese though, who else can order 20 or 30 thousand people to go and remove tons and tons of algae. Now! State media reported that 100,000 tons of the algae had already been taken out of the water. Much of it was being transported to farms as feed for pigs and other animals, according to news reports. Some algae will be reeducated through labor and become a active members of the working class, if it knows whats good for it.